To efficiently manage and prevent species invasions, we need accurate predictions of where these species can arrive and persist. Species distribution models make such predictions by relating species occurrence data to climate variables. However, applying these models to freshwater invasions is complicated because (1) the species might still be finding new suitable habitat and (2) most climate data is based on terrestrial measurements. 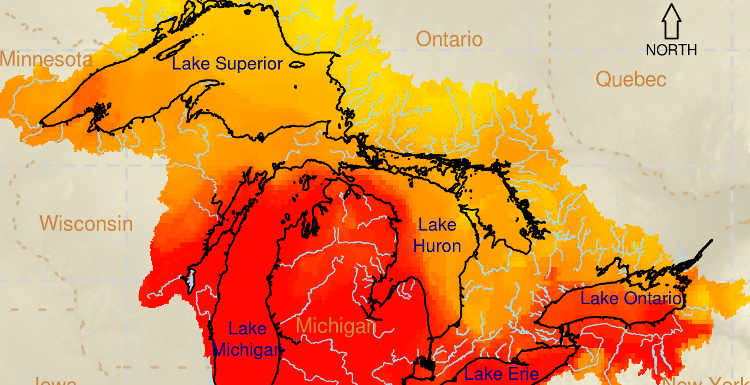 To overcome these obstacles, this study combined “range bagging” (a species distribution model developed by John Drake) with aquatic habitat information from the North American Great Lakes region to predict suitable habitat for three potential invasive species: golden mussel, killer shrimp, and northern snakehead. Range bagging focuses on the limits of a species’ environmental tolerances, which may offer a more conservative (i.e., larger) estimate of where the species can invade. Indeed, range bagging did provide reliable predictions. Then, the aquatic habitat data was used to make more specific predictions of suitable areas. Results indicated that the Great Lakes region contains habitat suitable for northern snakehead, but only marginally suitable for golden mussel; habitat suitability for killer shrimp was intermediate. This approach illustrates the strength of combining multiple sources of data, and emphasizes the need for high-resolution measurement of freshwater habitats so that we can better predict potential invasive species.